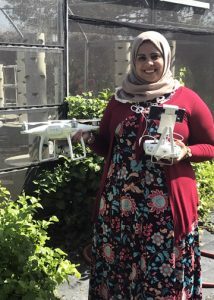 (HARLINGEN) – Growing up in Egypt, Dr. Sheren Elsayed Farag remembers she dreamt of being a plant scientist and she was determined, no matter what, to make it happen. Today, Farag is the newest Agricultural Technology instructor at Texas State Technical College and brings more than a decade of agriculture engineering and technology experience to the classroom. The 32-year-old said she is excited to be at TSTC and cannot wait to begin implementing technologies used in agriculture. Farag’s first step in her mission is to implement drones in her curriculum. The program has a total of five drones, four are consumer standard easy-to-fly drones for aerial photography and the other is a Multispectral Imaging Drone, popular to the agriculture field, to manage crops, soil, fertilizing and irrigation more effectively. Farag knows all too well the competitive nature of the industry and the types of opportunities students can have access to with this type of training. Farag earned a bachelor’s and master’s degree from Alexandria University in Egypt in Soil and Water Science and Soil Fertility and Plant Nutrition in 2006 and 2008 respectively. She went on to earn her second master’s degree and doctoral degree in Agricultural Engineering from the University of Seville in Spain in 2011 and 2014. Farag also holds a post graduate diploma in Integrated Planning for Rural Development and Environmental Management from the International Center for Advanced Mediterranean Agronomic Studies. And Farag should be very proud. She received a couple of prestigious fellowships in her field from the Spanish National Research Council in partnership with Junta para la Ampliación de Estudios and from the International Fellowship from American Association of University Women, she was the only doctoral candidate selected. It was the American Association of University Women that helped her get to the United States in 2016 and work as a Post-Doctoral Research Associate for the Texas A&M AgriLife Extension Service in Weslaco, beginning her extended stay in the states. Sammy Gavito, TSTC state lead and instructor for Agricultural Technology, said Farag’s knowledge in agriculture, soils, soil fertility and irrigation is impressive. Before coming to the U.S., Farag also worked with a fertilization company developing new fertilizers, as a researcher monitoring irrigation, fruit trees, soil, water and managing plant development in Egypt and Spain. And for four months, Farag spent time at Texas A&M-Kingsville as a plant physiologist controlling irrigation using meters and sensors. Farag who knows multiple languages, English, French, Arabic and Spanish, enjoys travelling, especially back to Egypt where her family stayed and said although she misses them she’s ready for her new adventure at TSTC. “All I want is to help make a big difference in students’ lives and make them aware of the research, opportunities and growth that the agriculture industry has to offer,” she said. For more information on TSTC’s Agricultural Technology, visit tstc.edu. This entry was posted in Harlingen on September 24, 2018 by Amanda Sotelo Sotelo.